Group revenue increased by 16% to R1.38bn, up from R1,18bn the same period last year while operating profit grew by 23% to R254m. The operating margin rose from 17,5% to 18.4% with improved profitability coming from economies of scale achieved across the business along with prudent cost containment. The group declared an interim dividend per share of 130c - a 20% increase on the previous comparable half-year's dividend. "Our brands‚ which are strategically populated across the South African landscape‚ along with a steadily increasing presence in the rest of Africa‚ continue to build a loyal following and in the process driving the back-end of our business‚" he said. Hedderwick said that despite subdued macroeconomic conditions‚ the fast food industry had remained relatively buoyant with more consumers choosing fast foods. The group's footprint at the end of August comprised 2‚180 restaurants across Africa‚ the Middle East‚ India and the UK. The group owns Steers‚ Wimpy‚ Debonairs Pizza‚ Fishaways‚ Mugg & Bean‚ Milky Lane‚ Juicy Lucy and House of Coffees‚ among others. Total revenue reported by the South African operation increased by 16% to R261m. Operating profit rose 21% to R158m‚ with a strong improvement in the operating margin from 57,9% to 60.7%. System-wide sales (including new restaurants) grew 14.9% while same store sales increased 8.5%. For the rest of Africa‚ the Middle East and India‚ revenue increased 36% to R23m and operating profit grew 57% to R9m. System-wide sales improved by 30.4%‚ while like-on-like sales rose 15.7%. This territory now contributes 8.2% (7.3%) of total system-wide sales (excluding the UK operation). Ten restaurants were opened in the rest of Africa during the period and a further 23 are planned for the rest of the year. The group's UK operation delivered revenue of R44m‚ in line with the prior year although operating profit grew by 72% to R4.7m. Hedderwick said: "Consumer disposable income will continue to be constrained and competition among industry participants is likely to accelerate. Margin pressure will remain a feature as fuel and food inflation continue to rise. "However‚ despite these factors‚ the food services category remains a robust one. 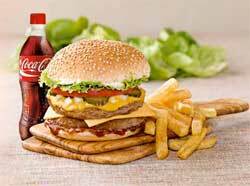 Industry statistics predict that consumption of fast food (as viewed over a four-week period) is expected to increase by a compound annual growth rate of 5.2% to 34.1m consumers in 2017 up from 20.4m consumers in 2008. In this context and by virtue of its offerings‚ the group remains optimistic regarding its future growth," he added.